Happy new year! It is that time again! 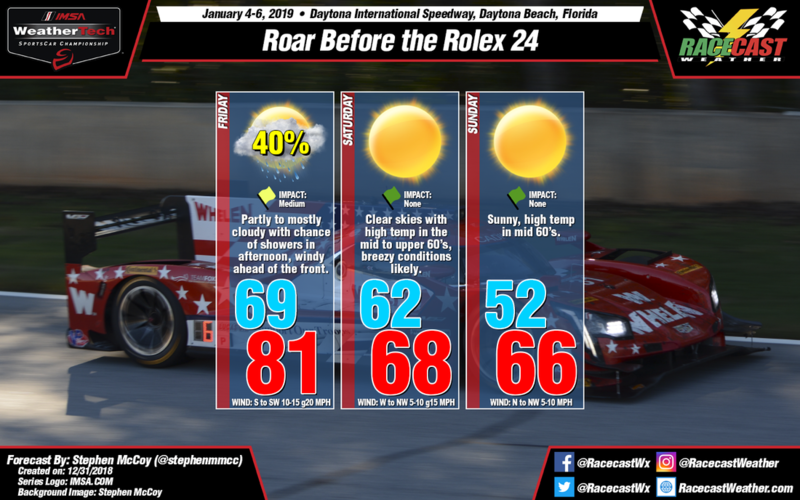 The 2019 IMSA season is almost upon us, and that means a new ROAR thread! Below are some necessary resource links for the 2019 Roar test. Please feel free to add any other links to this thread that I may have missed or that you feel are necessary additions. The weather looks good for this weekend, hopefully the rain won't affect Friday to much. Thanks to Racecast weather for the forcast. The race will start at 12:15pm EST. Last edited by Nick Woodbury; 2 Jan 2019 at 17:27. Mazda announce some big administrative changes, as well as a new endurance driver line-up! Last edited by Nick Woodbury; 2 Jan 2019 at 18:01. Some teams will come with their intended liveries, but there might be others where that won't be the case still I feel. Watch out for some trickery like what Porsche did at the Le Mans test. They showed up with 4 cars in full traditional factory livery (which I like a lot), and then we know what happened the next day. Pink Pig and Rothmans gets revealed. Maybe a white Ford GT. That looked nice. Thanks for the Roar intro Nick. There is probably a lot of angling for sponsors still going on, so the real estate of spaces on the cars is still on offer. I'm gonna say they're at least getting a podium in the Rolex - maybe even a win! Thinking about going to the Roar for the first time. Will be bringing my 3 year old. Can only make it Sunday - is there anything I should Be considering? How close can you get to the pits/paddock? Never been to DIS. I’ve been to Sebring and Road Atlanta years ago during the Audi years, for a starting point. Mazda has a killer driver line-up ... but they have Always had really quick drivers. The crew and the car have always been the week spots. And the car ... is the same car except they are planning to push it even harder. Look at home many endurance races there were leading are almost leading int he final hour ... where the car didn't finish. Fan, but a realistic fan. Except the only part that really matters, the Audi. Hmm, I guess Brumos would always be an option and I would really like a Löwenbräu-car, but I don't know if they could get away with that in terms of trademarks and all of that. No tips on the accommodation (sorry) but bring some good ear protection for the little one, their hearing is much more sensitive than ours! Doonan has some pull-Mazda must have made a heck of a financial commitment to have the might of Team Joest. Joest would want a big commitment to fund them, but also to protect their reputation. They are experienced and must see something in the Mazda. At least that is what I have bought. Interesting ponder- at this point what would satisfy Mazda as a success? Winning a championship, or winning an enduro, or winning any race?